MERS coronavirus. 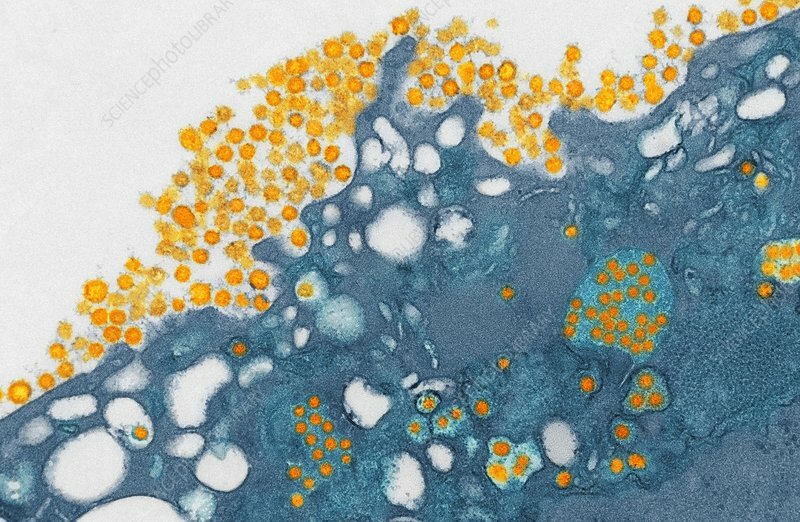 Coloured transmission electron micrograph (TEM) of MERS coronavirus particles (orange) budding from a host cell (blue). This virus (originally novel coronavirus 2012) has been named Middle East respiratory syndrome (MERS) coronavirus. It is thought to be similar to the ones that cause SARS (severe acute respiratory syndrome). A SARS-like virus killed hundreds in 2002 and 2003. This new virus, which first emerged in 2012, is being tracked by the World Health Organisation (WHO), with 54 confirmed cases and 27 deaths as of May 2013. The genetic sequence of the virus is being studied by the UK's Health Protection Agency. Magnification: x30,000 when printed at 10 centimetres wide.